When I was a little girl, my English mother would take me home every other year to see my grandparents who lived on the eastern side of the Wirral Peninsula. 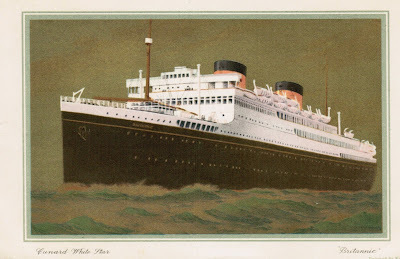 We would sail from New York Harbor to Liverpool on a Cunard White Star liner, the M.V. 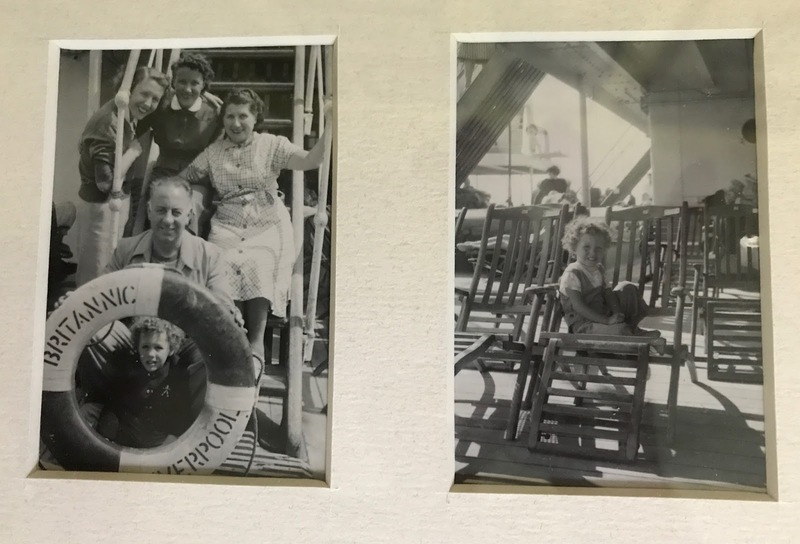 Britannic, a ship that took eight days instead of five to cross the Atlantic, and it was on that well-remembered ship I first became aware of how much I liked food. 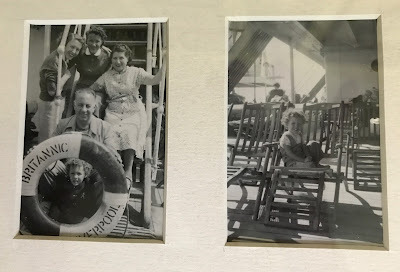 We had breakfast in the dining room; then steaming cups of consommé on deck at 11:00 a.m. Next, back to the dining room, was luncheon, followed by the 8:00 p.m. evening meal. In what is called the English manner, the steward wore white gloves and stood at each person's left side and used two serving spoons held in one hand to serve the food onto each dinner plate rather than carrying plates already filled with food to the table. We ate freshly-baked hard rolls with sweet butter, leg of lamb, peas cooked with mint, and craggy roast potatoes. I ate caviar for the first time when I ordered it off the menu for myself while sailing home to start first grade after already having learned to read while I was enrolled at The Rock Ferry Convent School during my stay in England. I was five years old. 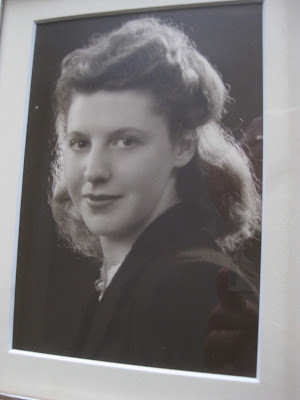 The steward got a funny look on his face, and my young and beautiful mother looked at him and said in her most English of English accents, "As she eats olives and anchovies, I imagine she will eat caviar. Please bring it to her as she requested." It came on a plate with little pieces of toast and tiny cubes of aspic, which, thankfully, turned out to be only a decoration. My mother was right. I happily ate the salty caviar on the dry crunchy toast. At my grandfather's house the food was good. We ate crumbly, pale orange Cheshire cheese, Hovis whole wheat bread sliced thin by hand and gently buttered, eggs boiled softly after being plucked from under the bottom of a reluctant hen, green onions on their stems, red radishes cut in half through the root end, and cherry tomatoes. 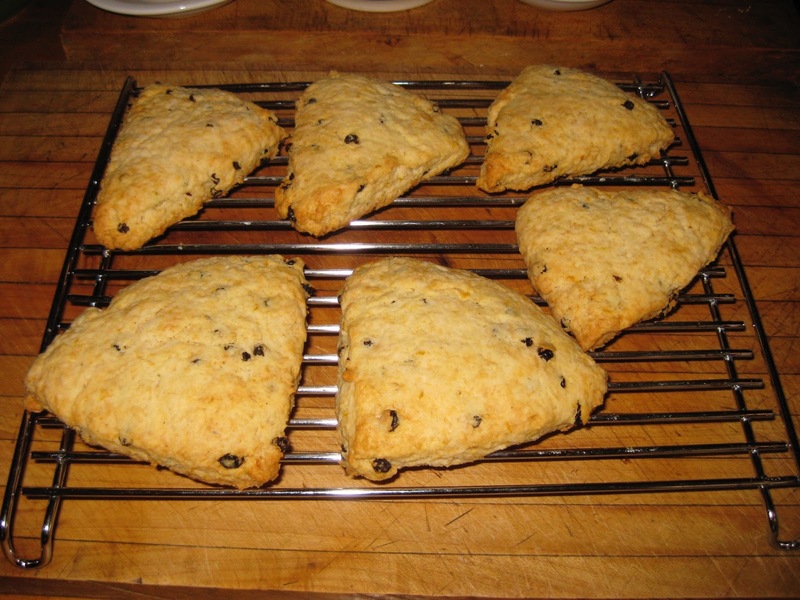 Sweets were only presented at the end of tea when we had company, but in the kitchen there was always a sponge cake and, usually, a plate of hand-shaped triangular current scones, available for the taking. 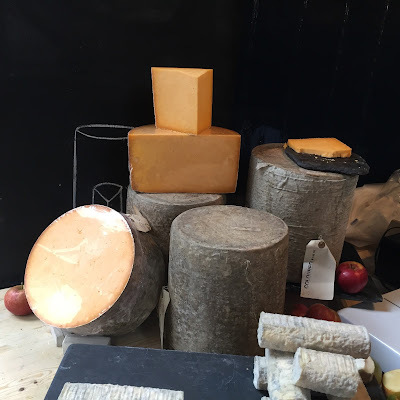 I am sometimes able to get Mrs. Appleby's Cheshire Cheese at Guido's, and I always buy it when I see it, but mostly what I crave from those days are soft-boiled eggs, always good but even better when I am able to get them from local hens. In the afternoon I eat them, as at my grandfather's, with buttered bread; in the early morning, with toast soldiers - pieces of toast buttered and cut into strips to dip into the soft yolks. 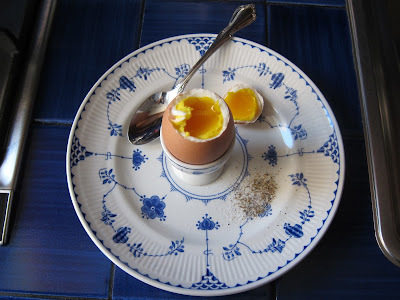 After trying many recipes and different methods for soft-boiled eggs, this is the one I like best. Please note calling them soft-boiled is really a misnomer as they are not boiled at all, but some expressions die hard. I got a subscription to Cook's Illustrated magazine with its first issue, and now I'm a digital subscriber to its progeny, America's Test Kitchen. 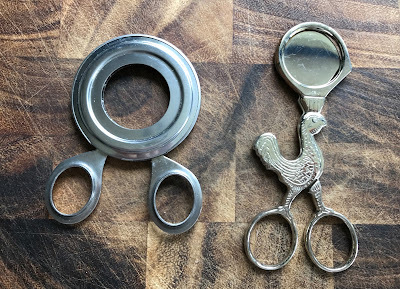 I use it for the usually fool-proof and always thoroughly-tested recipes and the equipment reviews, which have never steered me in the wrong direction. Special equipment: An egg cup used to be my preferred way of eating soft-boiled eggs, and when I eat them in a cup, I use an egg topper to take the top off. If you don't have an egg topper, you can tap the top of the egg with a knife to crack the top and then use the knife to cut the top off. However, lately I've just been cracking the just-cooked egg in the middle of the egg on a plate so I can split it in half and simply eat it with a spoon. I store my eggs in the refrigerator in the carton they came in, pointy side up. For this recipe, use large eggs that are straight from the refrigerator and still cold. Make sure they have no cracks. 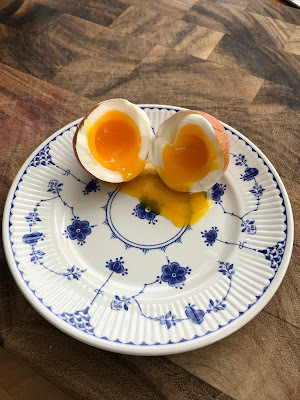 I don't prick a hole in the egg, and I always wash eggs before I use them as I often have local eggs from a farm, and it's a habit I have gotten into. 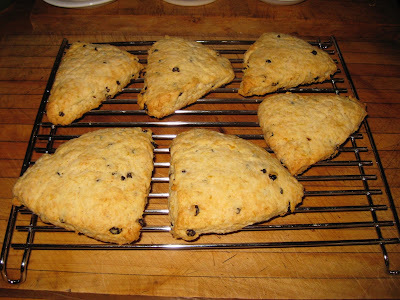 I have found this recipe and the timing works for me. I usually make 1 egg at a time for myself, but this recipe works just as well for up to 4. The eggs are essentially steamed, not boiled. Put an inch of water in a saucepan, and bring to a boil over medium-high heat. Carefully put the egg or eggs into the saucepan, and cover. Reduce the heat a little, and cook for exactly 6 minutes, 45 seconds. Using a digital timer is the best way to ensure you have the time right. When the time is up, remove the cover, put the pan in the sink, and run cold water into it for 30 seconds to stop the egg from cooking. Remove the egg or eggs from the pan and eat whichever way you prefer, in an egg cup or just cracked in two. I put a little mound of salt and pepper on my plate to dip my spoon in between mouthfuls.